Anna E. B. W. Howard, Copy of Record of Death Vol. 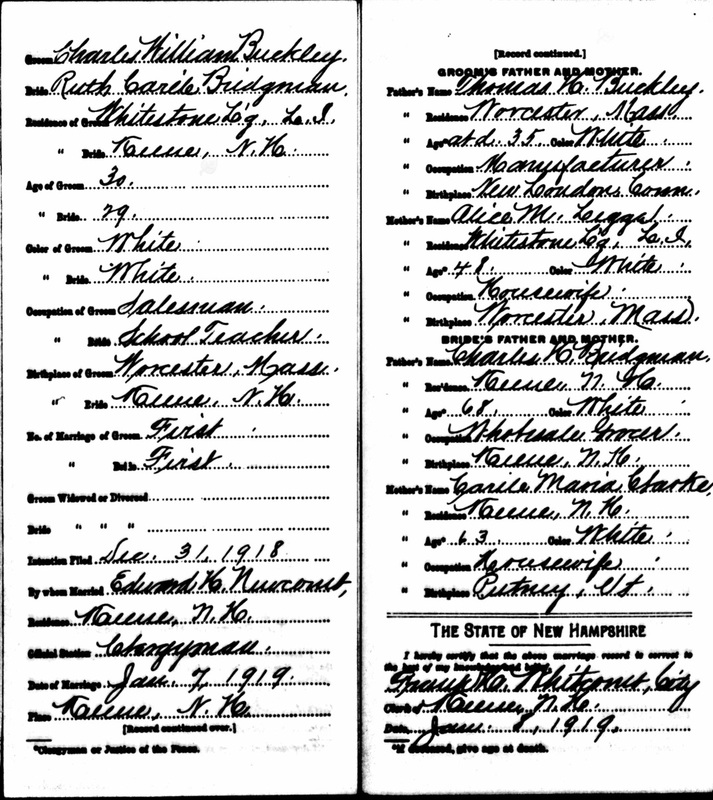 366, p. 329, #8920 (1885), The Massachusetts Archives at Columbia Point, 220 Morrissey Boulevard, Boston, Massachusetts, Birth date not given, but age at death shown as "67 yrs, 8 mos, 12 days". Hereinafter cited as Mass. Copy of Record of Death. The Boston directory..., Sampson, Davenport,. Massachusetts Vital Records, 1841-1910, , Vol: 366 ; Page: 329. Anna E. B. W. Howard, Mass. Copy of Record of Death. 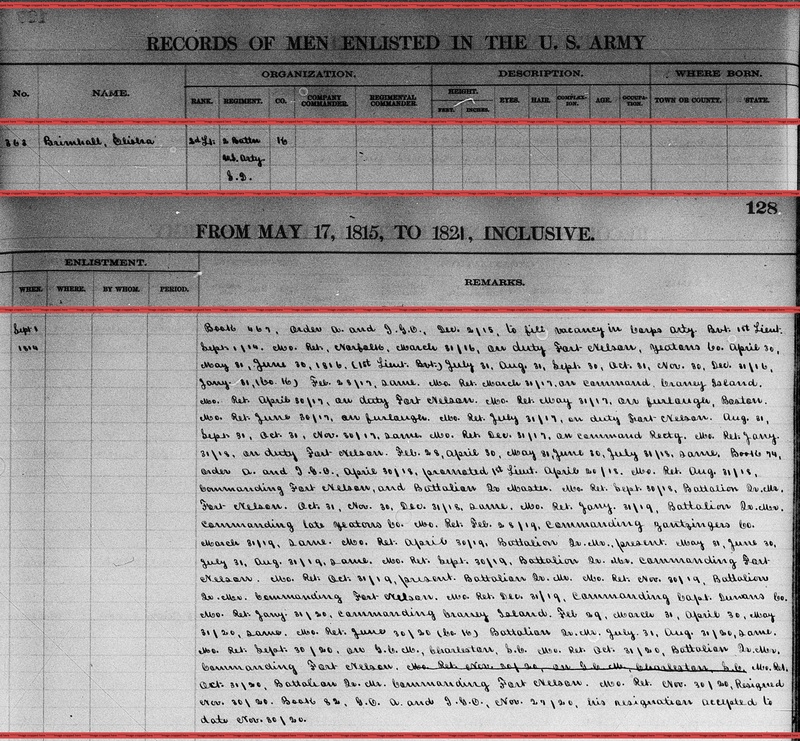 It appears Elisha Brimhall was stationed at Fort Nelson, Virginia, from 1815 until 1820. Matilda Brimhall was born perhaps about 1820. Abigail Brock was born perhaps about 1738. George Brock was born perhaps about 1676. 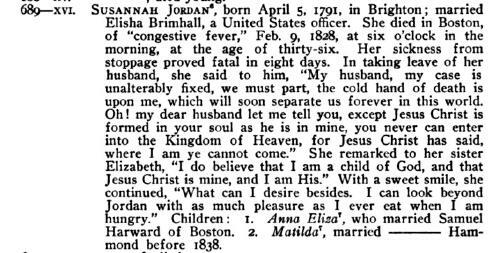 "Massachusetts Births and Christenings, 1639-1915," database, FamilySearch (https://familysearch.org/ark:/61903/1:1:F4DK-R4W : accessed 10 February 2016), John Brock, 29 Jul 1711; citing Boston, Suffolk, Massachusetts, v 24 p 73; FHL microfilm 14,734. 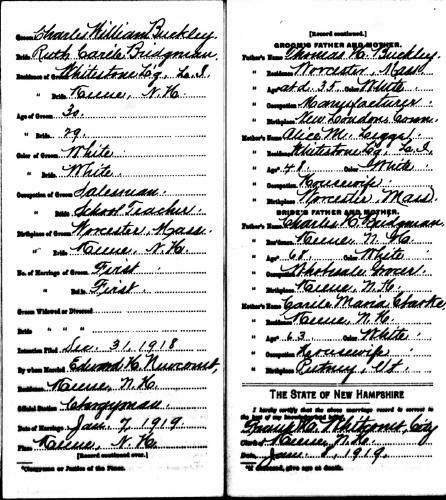 "Massachusetts Marriages, 1695-1910," database, FamilySearch (https://familysearch.org/ark:/61903/1:1:FC68-F9H : accessed 10 February 2016), George Brock and Mary Favor, 28 Sep 1702; citing reference ; FHL microfilm 0928191 IT 2. 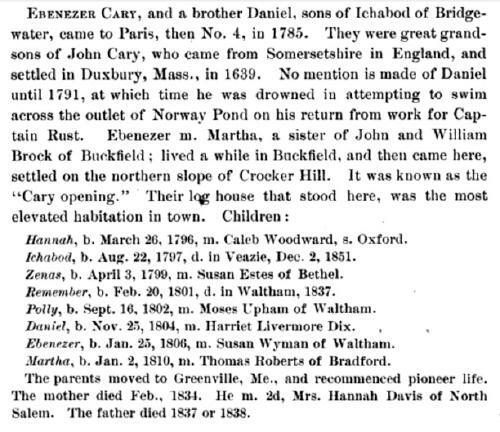 "Massachusetts Births and Christenings, 1639-1915," database, FamilySearch (https://familysearch.org/ark:/61903/1:1:FHYX-QS9 : 4 December 2014), George Brock, 08 Oct 1705; citing Boston, Suffolk, Massachusetts, P33; FHL microfilm 14,734. 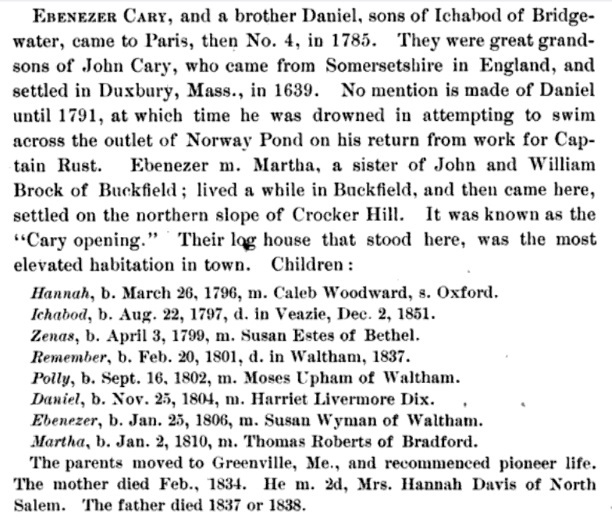 "Massachusetts Births and Christenings, 1639-1915," database, FamilySearch (https://familysearch.org/ark:/61903/1:1:FHYX-6BC : 4 December 2014), Philip Brock, 18 Feb 1706; citing Boston, Suffolk, Massachusetts, P45; FHL microfilm 14,734. "Massachusetts Births and Christenings, 1639-1915," database, FamilySearch (https://familysearch.org/ark:/61903/1:1:VQXV-HHD : 4 December 2014), Mary Brock, 16 Oct 1708; citing BOSTON,SUFFOLK,MASSACHUSETTS, ; FHL microfilm 0014734 V. 24. "Massachusetts Births and Christenings, 1639-1915," database, FamilySearch (https://familysearch.org/ark:/61903/1:1:VQXK-JJW : 4 December 2014), George Brock, 17 Dec 1709; citing BOSTON,SUFFOLK,MASSACHUSETTS, ; FHL microfilm 0014734 V. 24. "Massachusetts Births and Christenings, 1639-1915," database, FamilySearch (https://familysearch.org/ark:/61903/1:1:F4D2-35P : 4 December 2014), Peter Brock, 22 Jul 1713; citing Boston, Suffolk, Massachusetts, v 24 p 89; FHL microfilm 14,734. 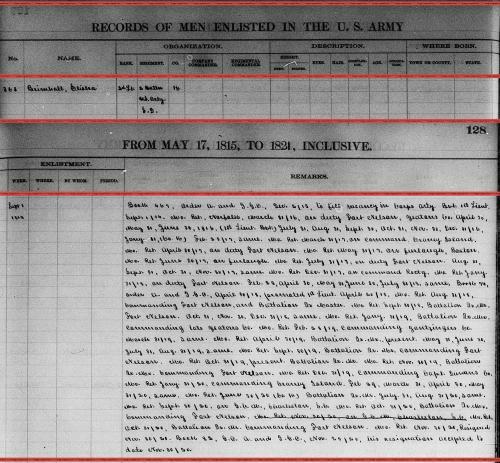 "Massachusetts Births and Christenings, 1639-1915," database, FamilySearch (https://familysearch.org/ark:/61903/1:1:F4DH-HLQ : 4 December 2014), Thomas Brock, 05 Apr 1715; citing Boston, Suffolk, Massachusetts, v 24 p 103; FHL microfilm 14,734. Vital records of Gloucester, Massachusetts to the end of the year 1849, Salem, Mass. : The Essex Institute, (1924) , p. 116.